I can’t believe how fast the days are zooming past. Was it just a week ago we celebrated LD’s 6th birthday?! Within a month’s time he will finish his year 1 and move to year 2 this fall! It is going to be painful and really difficult to say goodbye to the teachers and the teaching assistants who have helped him with the transition and made his first year in big school a memorable one. With the summer holidays fast approaching, I’ve decided to make a little handmade and homemade gift for the most important people in LD’s school. This is our way of saying thank you. Among other, one thing I am going to include is a jar of Vegan Spicy Tomato Chutney. 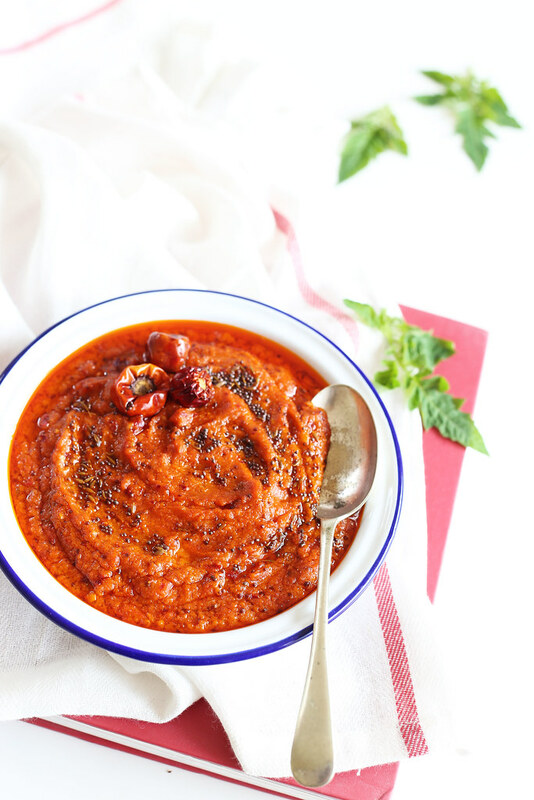 This is not just any tomato chutney; this is THE Tomato Chutney that has conquered my heart and taste buds! 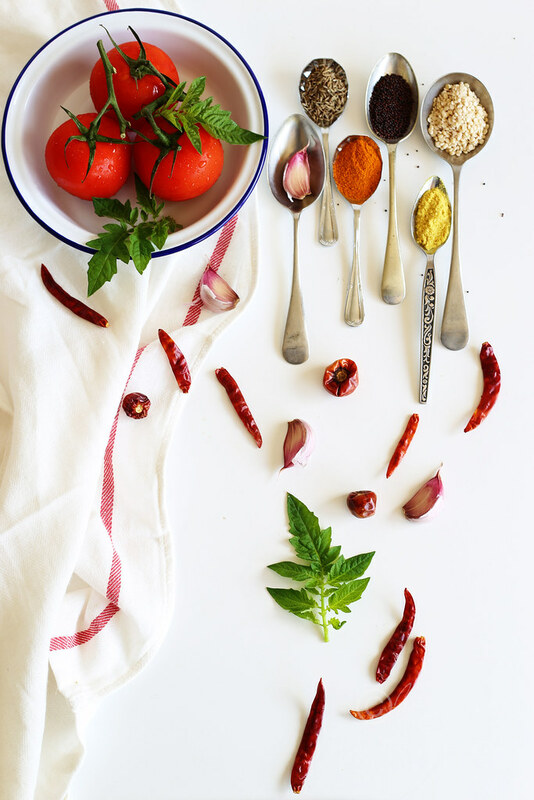 While some recipes need long list of ingredients and lengthy recipe, there are few recipes with just a handful of ingredients which you will be able to cook even with your eyes closed! OK, a slight exaggeration, but I hope you get my point. 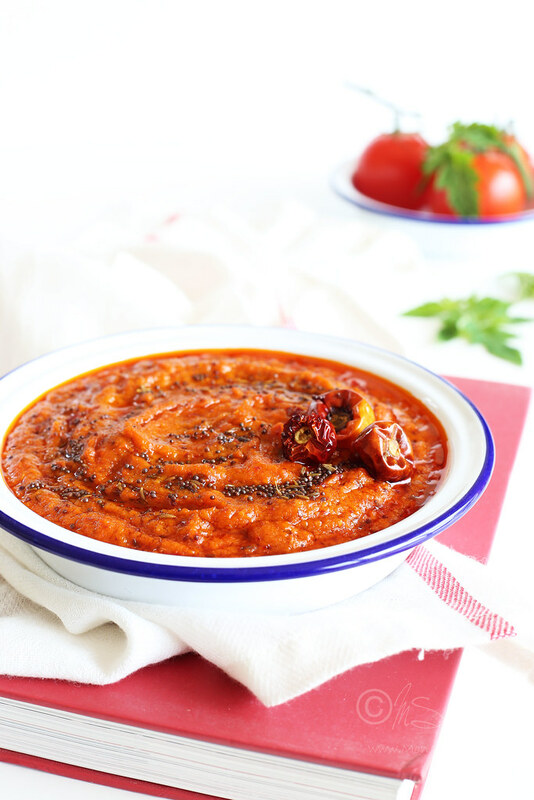 This deep red tomato chutney is one of easiest recipe with simple recipe instructions. It is one of those versatile dishes that come handy for those days when you just don't feel like cooking! 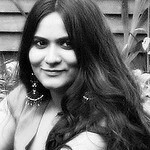 I serve it with South Indian breakfasts like idli and dosa, with roti/chapatti, with rice, dal and ghee, as sandwich spread, as salad dressing and even as a filling for veggie wraps and pitta pockets with little salad leaves, onions, cucumber, avocado and tomato slices. 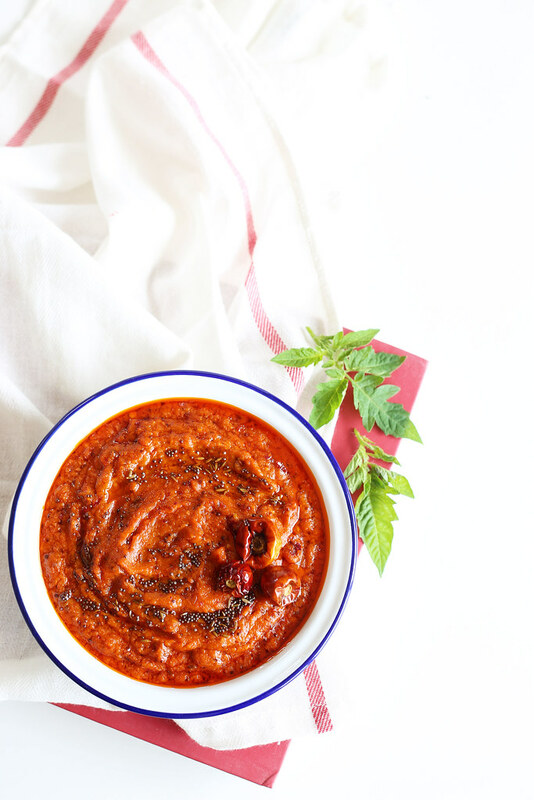 This tomato chutney comes handy when you are travelling and crave for some quick and simple Indian meals. Just mix the chutney with cooked rice and ghee for a simple, quick and delicious meal. Also you can stir a generous spoonful of this chutney with cooked dal to make simple dal after a long day at work. Did I get your attention? Good! 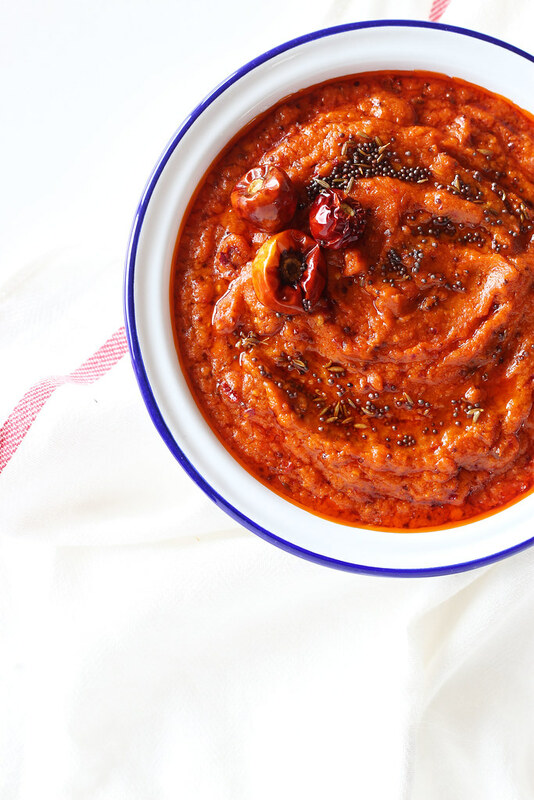 The recipe for this Spicy Tomato Chutney is from my little sister. I have made it 5 times already since she mailed me this recipe a month ago. I have also tweaked it a little bit to suit my taste. I suggest you choose little tart tomatoes, but if you have sweet tasting ones, just increase the amount of tamarind pulp as per taste. 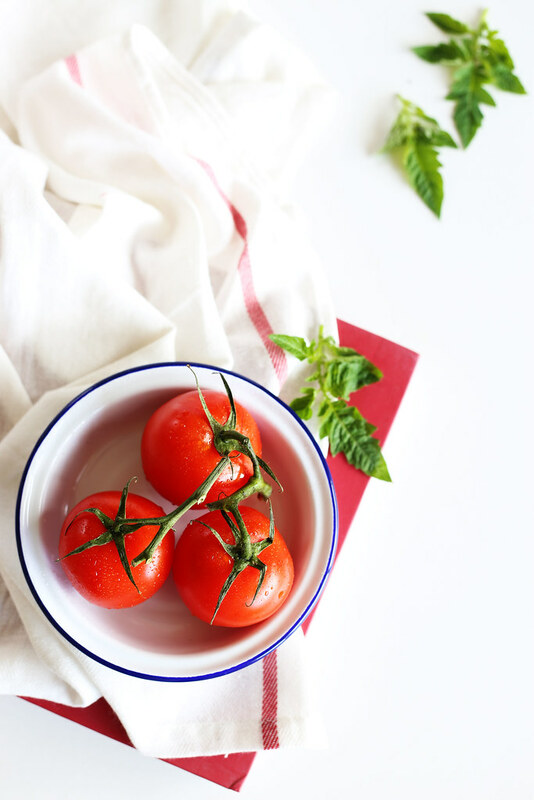 With fresh tomatoes in every size, colour and taste overflowing in markets, this is the best time to go ahead and cook a jarful, or a dozen of this tomato goodness! Heat ½ tbsp. oil in a pan on medium flame and add chopped garlic pieces. Fry them until the edges turn golden, about 1 min. Next add cumin seeds and urad dal. Sauté until urad dal turns light golden. Mix in chopped tomatoes, turmeric powder and a generous pinch of salt. Cover and let it cook for 3-4 minutes. Add tamarind pulp, dried red chillies and switch off the flame. This way the tamarind pulp and dry red chillies will soften in the heat and will be easy to grind. Let the mixture cool down to room temperature. 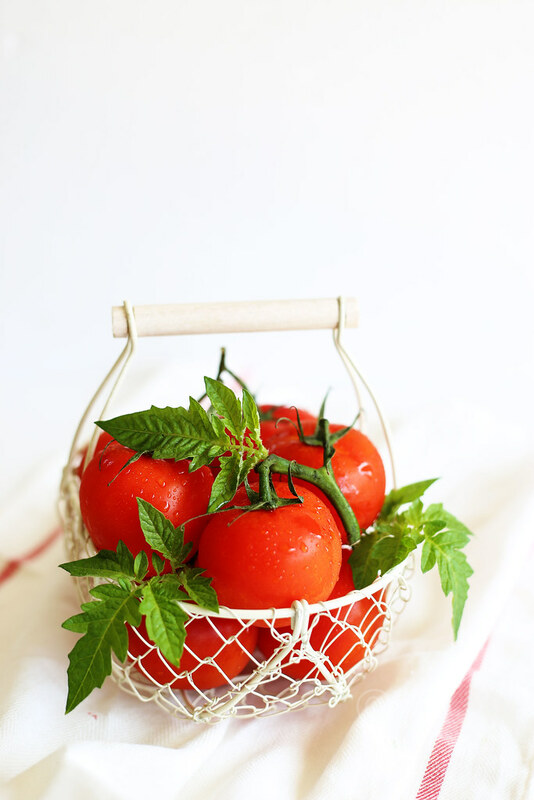 Once the tomatoes have cooled down, grind them to soft paste without adding any water. Keep it aside. Heat 2 tbsp of oil in a pan and add mustard seeds and cumin seeds. When mustard seeds start to sizzle and pop, add dried red chillies and hing. Fry them for couple of seconds. Mix in ground tomato paste and keep stirring it for 3-4 minutes on medium heat. Add jaggery, salt to taste and continuously stir it until the mixture thickens and the oil starts to ooze and leave on the sides of the pan. It will take anything between 8-15 minutes depending on the amount of moisture in tomatoes. Adjust the seasonings before turning off heat. Let the mixture cool down to room temperature before storing it in an air tight jar. Pop the jar in refrigerator and use within 10 -14 days. I suggest you choose little tart tomatoes, but if you have sweet tasting ones, just increase the amount of tamarind pulp as per taste. Try not to skimp the amount of oil used as it helps to preserve the chutney. If you reduce the amount of oil used, then make sure you use it within couple of days. I serve it with South Indian breakfasts like idli and dosa, with roti/chapatti, with rice, dal and ghee, as sandwich spread, as salad dressing and even as a filling for veggie wraps and pitta pockets with little salad leaves, onions, cucumber, avocado and tomato slices. 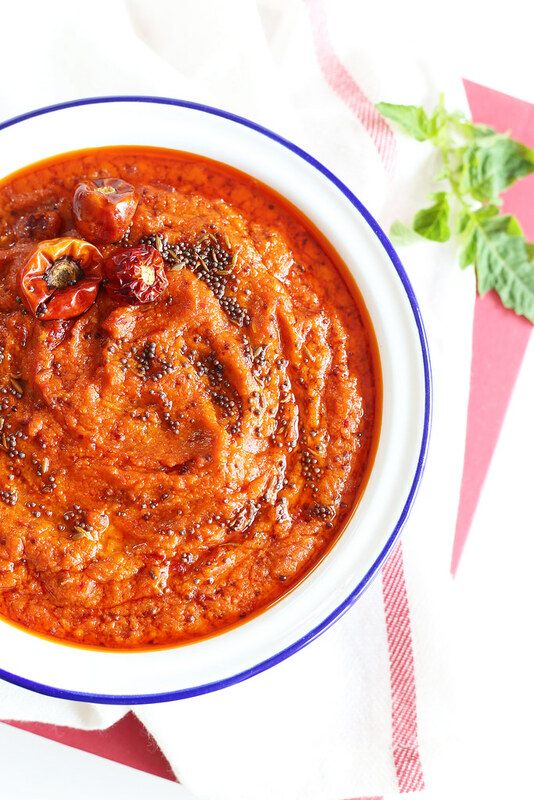 This tomato chutney comes handy when you are travelling and crave for some quick and simple Indian meals. Just mix the chutney with cooked rice and ghee for a simple, quick and delicious meal. 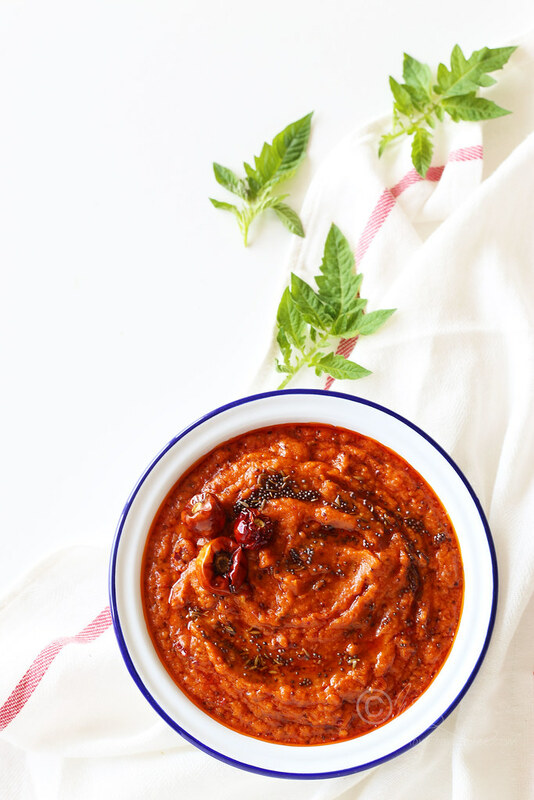 You can also stir a generous spoonful of this chutney with cooked dal and generous handful of coriander leaves to make simple dal after a long day at work. Such a velvety texture. I made tomato sauce this morning but would have made your recipe if I had seen it earlier. Oh well, soon! Sia, I made the chutney today. Oh my! So spicy and tasty. I hope you don't mind if I post about it. Of course, I took my own photos, changed the recipe a tad and will OF COURSE, give you credit for the recipe and I won't steal your words. A total shame all that plagiarism going around. I've had to deal with such troubles in the past (though my photos and write ups are not nearly as good as yours). Once some site basically stole ALL of my content and I've been blogging since 2007! It's especially maddening considering all the hard work we bloggers put into our space. All the best in getting that app shut down. Ha ha ha... I did warn about it being little spicy 😄 Glad to know you liked it. Please do go ahead and post it. Most bloggers do understand the importance of giving due credit to the original source, but there are some who think it's okay to steal content! So sick and tired of them. It's uphill battle that just goes on and on! I do hope that we can bring this app down which will serve as a warning for others who think it's okay to plagiarise contents from us!